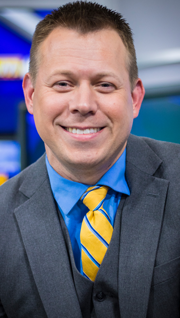 WNDU’s (South Bend) station motto is “This Is Home” and the station had employed Meteorologist David Harker, who was born and raised in the South Bend area. It seemed like a perfect fit, a hometown guy giving the weather to viewers in his hometown. But it seems that WNDU’s owner Gray Television did not see it that way and they kicked Harker, who’s wife is pregnant, to the curb. Then they sent a memo out telling the staff not to talk about how the company just fired the popular Weatherman. Harker is being replaced by Kimberly Newman, who most recently worked at the awful Sinclair station WNWO in Toledo. That’s the station that does the newscast for Toledo, Ohio out of South Bend, Indiana. Newman is now joining the Gray station in South Bend, Indiana, despite the fact she was one of the few people at WNWO that was stationed in Toledo. FTVLive obtained the memo on Newman’s hiring as well.